A few days ago, one of my clients mentioned the following odd issue with his personal computer: Suddenly, the computer restarts when connected to the Network/Internet, without any reason or other warning. Problem in details: A Windows 7 based PC, works normally with the network disconnected, but it shuts down and reboots when connected to network either by WiFi or LAN. Another symptom of the issue is that the PC and the Network connection (and Internet) work without any problem in Windows Safe Mode. 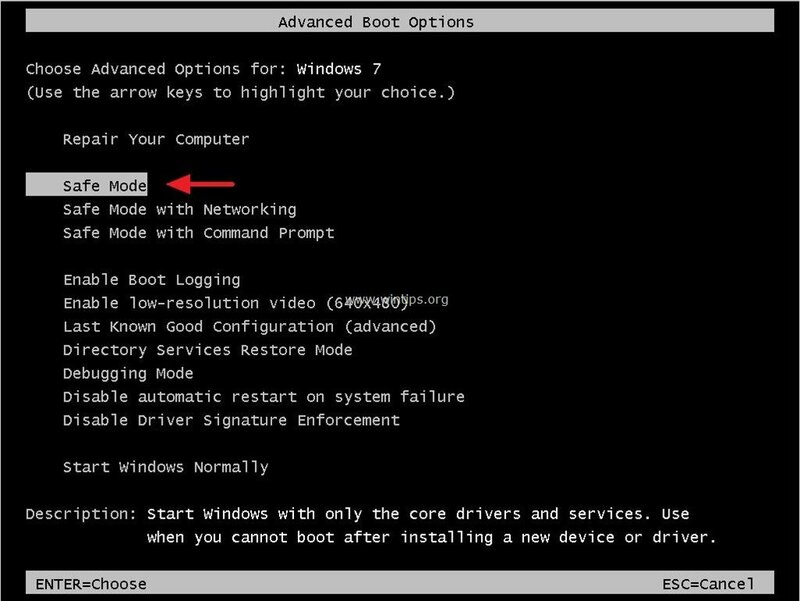 In this tutorial you 'll find instructions to fix the following issue on Windows 7 OS: Computer Restarts When Connected to Internet via LAN or WiFi. How to FIX: PC Shutdown and Reboot When Connected to WiFi or LAN. Method 1. Scan your System for Viruses & Malware Programs. Method 2. 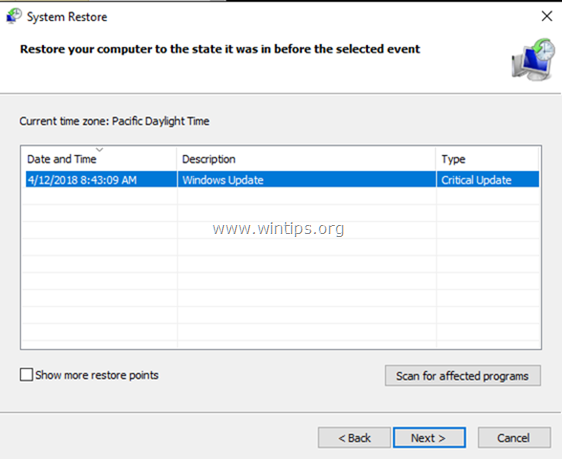 Run System Restore from Windows Safe Mode. Method 3. Uninstall Recently Installed Updates. Method 4. Prevent the Installation of new Updates. Step 1. Start Windows 7 in Safe Mode. 1. Close all programs and reboot your computer. 2. Press the F8 key as your computer is booting up, before the appearance of the Windows logo. 3. When the 'Windows Advanced Options Menu' appears on your screen, use your keyboard arrows keys to highlight the "Safe Mode" option and then press ENTER. Step 2. 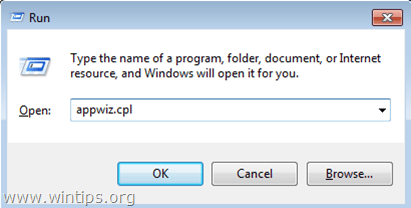 Restore Windows 7 to a previous Working Safe Mode. 2. 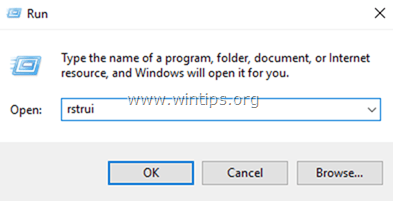 Type rstrui and hit OK to open System Restore..
2. Press Next at the first screen and then select an older restore point to restore your computer. 3. Follow the onscreen instructions to start the restore process. 4. Wait until Windows restores your system to the selected state. 5. When the system restore is completed, try to connect to the Network/Internet. If the connection is successful, then proceed to the next step. Step 3. Install all Available Windows Updates. 2. In run command box, type: wuapp.exe and press Enter. 3. 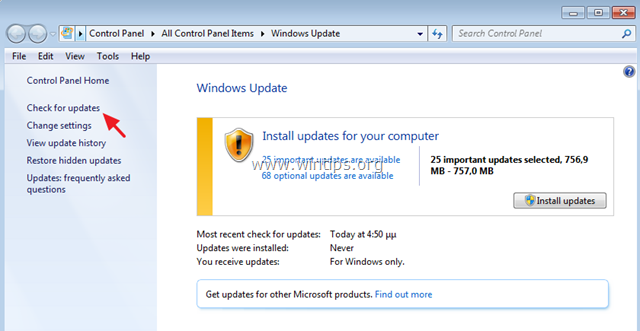 Click Check for updates on the left pane and then choose Install updates. 4. When the update installation is completed, restart your computer. 5. After restart, try to connect to the Internet again. If your computer restarts again when connected to the Network/Internet, then proceed and uninstall the recently installed updates by following the instructions in Method-3 below. The next to fix the reboot problem when connected to Network/Internet is to uninstall the recently installed updates. Step 2. Uninstall Recently Installed Updates. 2. Choose View installed updates on the left. 5. After the uninstall, restart your computer and then try to connect to Internet. If you still face problems, then continue to the next method. The final method, to resolve the restart issue when connected to Internet is to restore your system to a previous state and then to prevent Windows from installing the available important updates. 1. Follow the steps 1 & 2 from method 2 above to restore your system to a previous working state. 2. After the restore, navigate to Windows Update center and Check for Updates. 3. Click to view the available important updates.